Monday, my work-at-home day. Most of my “home” work is computer related, so often after straining my eyes and body, I take a break by throwing in some laundry, washing dishes, or some other household chore. Today dish washing was in order. We went to bed last night without doing the dishes and the stack was staring me down the second I entered the kitchen. After getting the kids off to school, I threw the dishes in a sink full of water, letting the soaking time take a bite out of my scraping and scrubbing time. 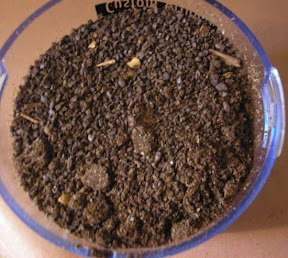 I also cleaned out our coffee maker (a percolator) and made a fresh batch of coffee, in the manner I earlier explained. The picture below features 8 O’Clock Columbian beans, which I am pretty certain I won’t be buying again (unless I forget that I detest them and throw them in my cart like, apparently, I did this last time). They just don’t brew the kind of tasty, rich cup that I enjoy. Anyway. 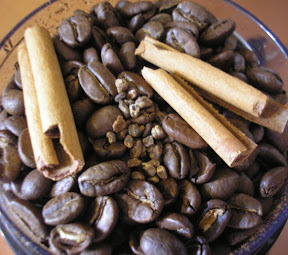 12 cup portion of beans + 1 cinnamon stick + a healthy pinch of cardamom. Mmmmm. There are healthy properties in cinnamon, too, don’cha know? More information on the health benefits of cinnamon. I also did some meal planning and have dinners set through next Wednesday. Shyuh. Got my “home” work done. Purchased a skateboard magazine subscription for Dants as part of his birthday present. When the kids got home from school I popped up some popcorn in the iron pot. 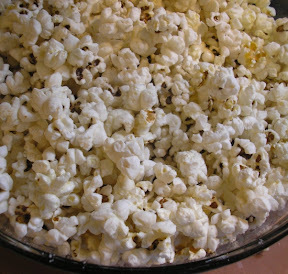 Stove-popped popcorn, popped in coconut oil, drizzled with melted butter and sea salt. Lootie and I sat on the couch with the bowl between us, reading enjoying salty, buttery bites. 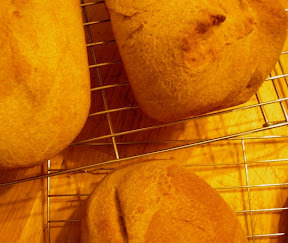 Gotta say the smell of baking bread warms a home nicely. But the bread was for dinner, even though our household managed to eat an entire loaf before we made it to dinner. We had meatloaf, corn, salad and homemade bread — Franny said, I LOVE this dinner!!!. I even managed to go grocery shopping with my thought-out list (applause). I spent $204 dollars, with a savings of $40 (store sales and a couple coupons).Though I got a lot accomplished, there is always much, much more to do and I find myself having increased difficulty getting everything done. I used to keep notes and lists in a spiral-bound notebook, but got too busy and lazy for that (self-defeating, I know I know). I think, for my own sanity, I need to start one up again. Organization helps me to get more things accomplished and be a better manager of my time and money. Tomorrow I go to work, but Wednesday I’m taking off since Frank has off. We need to shop. Together. Yay. I feel like we haven’t seen each other in a while. I’m looking forward to spending the day together. We need that. Saturday night dinner. Here’s what I did. The twins had a 7am indoor soccer game (totally NOT a responsible time on a Saturday, I say), and then Lootie had a game at 2pm. 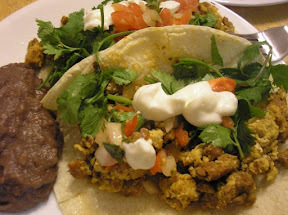 After that, we came home, settled in on the snowy evening, and had tacos. Watched a movie. First day of December, first day of Holidalies blogging. For the past week or so, each morning when I awake I glance outside to see if there is snow on the ground. Not because it is in the forecast — just because it feels like it should be snowing. Today, was the day. The kids, up before Frank and I, were the ones to tip us off. The awestruck screech, “Snoooooooow!! !” jolted us. So much for Sleeping In Saturday. You’d think after a lifetime of Wisconsin winters, snow would not be a big deal. But every year, it surely is. Not just for the kids, but for adults as well… including me. Ours went well, not without a hitch but hey — I never expected things to go smoothly. Earlier this week I couldn’t find sweet potatoes. Finally found some yesterday (at Wal-mart). I put them in the oven to bake, telling the two oldest that when the buzzer goes off to turn the oven off, and went to a friend’s house. Naturally, they forgot (D said, “Oh turn the oven off? I thought you meant turn the buzzer off.”) and my potatoes turned into hollow shells reminiscent of a sweet potato. I placed them cool outside overnight hoping that some of them could be salvaged. Today Franny and I were able to scrape out only a few cups worth of potatoes, so Frank had to make a trip back to Wal-mart (naturally open on Thanksgiving, of coarse). Power blew out in the kitchen. Mini crisis/heart attack for that ordeal. But it all worked out. Food was cooked, company came, we ate and were merry. I was hoping to play some board games, but everyone is just tuckered out. For a few years now, we have made a conscious effort to feed our family healthier foods, opting for items made with natural ingredients and minimal chemicals. I have to admit, it isn’t always easy on a limited budget. We do some of our shopping at Whole Foods, but don’t/can’t do all of our shopping there because it would break the bank. Though we purchase more organic foods than we did five years ago, instead of simply buying blanket organic, we buy organic for many of our “staple” foods (milk, eggs, olive oil). As always, it helps to comparison shop. Where I live, one store has better produce, once has better bargains on dry goods, and depending on the season, the farmer’s market is another option. We are also fortunate enough to have a relatively large local grocery store that carries a good variety of organic items at lower cost than some of the more upscale grocers supplying identical products. I made this chicken casserole the other day for dinner. It was delicious. I’m constantly clipping and printing recipes, and so many of them I forget to try. Really glad I tried this. It was easy to make and fed us for more than one meal — and was one of those leftovers that tasted just as good if not better the next day.You can find the recipe here. Every now and then we order pizza from Rossi’s in Monona. The pizza is good, but I gots to show you a picture of it. Keep in mind that we’re a family of seven and never (well, almost never) does one pizza work for feeding all of us. This pizza is the exception. It is huge. If I remember correctly, it is 30 inches. Frank is holding it. You have to turn the box sideways, carefully, to fit it through the door. The big factor isn’t all, though, it is a tasty pizza as well.